Tortilla press for flattening balls of dough into thin tortillas. It is made out of light cast iron and is 7" in diameter. Aprox. 5 lbs. Tortilladora. Prensa para Tortillas. 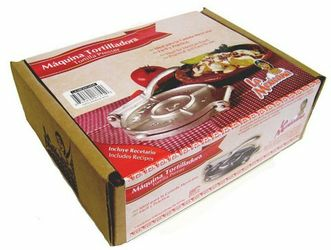 To make tortillas, line the base of the tortilla press with a sheet of plastic wrap. Pinch off balls of dough from the masa. Center the masa on the lined tortilla-press base. Cover the masa with a sheet of plastic wrap. Lower the top of the press and push down the handle. Open. The tortilla will have plastic wrap on the bottom. Carefully peel away the plastic on top. Place your hand under the tortilla. Flip the tortilla onto the other hand so the plastic is on top. Carefully peel away the plastic. Flip tortilla onto a preheated, very hot griddle or comal. When the tortilla begins to dry on the edges, flip it over. Cook until the top begins to puff. Tap lightly with your fingertips to allow for even puffing and let cook for 1 1/2 to 2 minutes. Remove tortillas, wrap in a napkin or clean towel, and serve. Tip from Debbie McDade: We discovered how useful a tortilla press is for spreading the Masa in making Tamales. We make the dough then press a ball of it between 2 pieces of wax paper (which can be used many times). Then we remove 1 piece of the paper and lay it on the corn husks. Remove the other piece of paper and fill, roll, and cook. You wouldn't believe how much easier it is to make tamales! Prensa para aplanar bolitas de masa para hacer tortillas. Tortillero. Tortilladora. Torteadora. Prensa para hacer tortillas. Maquina Tortilladora. Antes de usar su maquina tortilladora de metal, favor de lavar con agua y jabon su tortilladora. being of hispanic origin, I decided to purchase this item, to make my cooking a little easier.....was not completely satisfied with the press, my flour tortillas, were more smaller on this press, than when I roll them out......maybe it was not the right press for making flour tortillas. It's made for corn tortillas. Works great! It is priced well and works well. Easy to use. I highly recommend this item, especially if you cook alot of Mexican food. The heavier iron press made it effortless to make fresh, tasty homemade tortillas. I preferred the cast iron over the cast aluminum, although both are good. It's easy to use and fun for kids to help out in the kitchen. Over all, an exceptional value for a solid product. Great addition to your kitchen arsenal. Works like a charm......very easy to use!